Upper level floors may be heated by embedding electric heat cables or tubing in a gypsum material on top of a wood floor or between them. Heat pipes can be suspended between the floor joists of existing floors to provide a heated floor. 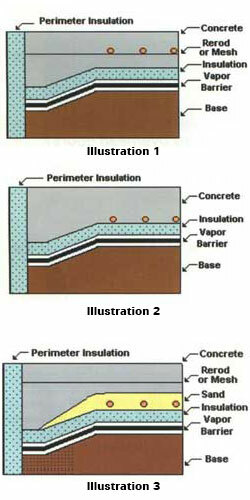 Insulation must be used below the floor to direct the heat upward. A radiant heat system heats like the sun. Radiant heat waves move through the air. Once they strike an object, they transfer their heat energy to that object. That object can be a table in a room, a piece of equipment or even a person. The object retains the heat and gives it back to the room, providing a comfortable temperature. One benefit of radiant heat is the surrounding air temperature does not have to be as high as the air temperature to be comfortable. This is similar to standing in a window on a sunny day. The air temperature can be cooler but you feel comfortable because the radiant effect of the sun shining on you. Another benefit of radiant floor heat is it puts heat where it is needed - at the floor. Radiant heat provides the most even floor-to-ceiling temperature of any type of heating system. ​Can I install tubing on upper floors? Of course, there are different methods of installing tubing on sub-floors. It is very important to have the right amount of tubing and proper layout for these types of installation. Tubing is attached to the top of the wood sub-floor. Lightweight concrete or gypsum is poured over it. Finished flooring or carpeting is installed over concrete. ​Wood strips and sleepers are glued and nailed to the sub-floor. Tubes are placed between the sleepers Gaps between sleepers can be filled with sand to increase heat-holding capacity. The floor is then covered with a plywood cover sheet. Finished flooring or carpeting is installed over plywood cover. ​Tubing is attached to joists underneath the sub-floor. By installing the tubing on the sides of the joists, tubing damage can be avoided from nails or screws placed in the floor. Installing the between the joists is the least desirable method of installation. There is no mass to hold the heat and radiate from. The R-Value of the floor covering becomes very critical with this method. It is also more difficult to install. How much insulation do I need under the sub-floor? Generally, if the floor is under an unheated basement use R-19. If a floor is over a heated basement, use R-13. When installing over a crawl space use R-30. Can I use a water heater to heat my building? This is a popular idea and may work for you but it depends on how much heat your building requires. Water heaters are limited on BTU output. Aqua-Floor can run a heat loss calculation for your project. From this, we can advise you of your needs. ​Does the tubing go directly into the concrete? ​All three of these systems work equally well. Choose whichever system is easiest to layout for your situation. Placing the tubing in the sand may make it easier to trowel concrete because the water can go into the sand. Installation recommended is closed cell polystyrene in a minimum of 1" thickness. Vapor barrier is a 6 mil plastic.